Electronic Health Records (EHRs) are meant to ease the everyday workings of physicians, clinicians and administrative staff in the healthcare sector. However, the reality is quite different. EHR usability has rarely lived up to its expectation and healthcare employees seem to be spending a considerable amount of time on managing this data to make it meaningful. This has resulted in a prevailing disappointment over EHR documentation and patient interaction. We notice that some of the biggest software developers in the market have identified the frustrations linked to EHR and are working on innovative solutions to close the gap between what EHR is perceived to achieve and the current reality. Artificial Intelligence (AI) is a tool that can turn basic EHR into ‘Smart EHR’, through Machine Learning (ML) and voice recognition technologies. From improvising patient visits to the clinic or other healthcare organizations, to accurate and availability of care, the possibilities are endless. Doctors and clinicians have to spend long hours in front of computers updating and managing EHRs, which is causing a considerable amount of dissatisfaction with patients as it cuts into the time spent on a face-to-face interaction and by the bed-side of the patient. EHRs are overloaded with unstructured information and any specific information extraction turns into a tedious process, where a considerable amount of time is spent in locating that particular item through the vast volume of information. Real-time inputs are still lacking due to non-compatible mobile versions and limited functionality of EHR systems, which result in an impractical approach where doctors have to access desktop versions of the software for accurate inputs. 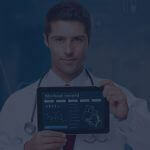 Patient record updating, access to lab results, and ordering of medication is still in its nascent stage on mobile apps. The documentation requirements of the current EHR system are very high and add to the cumbersome nature of the technology. When AI, ML and Voice Recognition technologies are applied toward EHR optimization, there are various areas that can be automated, which significantly increases the efficiency of the data. Through complex voice technologies, EHR data can be utilized to enhance patient experience and create automated routes for clinical visits. Digital scribes can replace human scribes to reduce a physician or clinicians time spent on data entry, thereby improving doctor-patient interaction. Through the use of speech recognition technology, compounded with machine learning, information of the patient visit and clinician interaction can be automatically uploaded into the EHR system. Adoption of virtual AI assistants that tune in during doctor-patient interaction and take notes that are relevant to EHR. The assistant makes the suggestions that can be finally approved by the doctor for recording and documentation. Voice assistants to be deployed at clinics and hospitals that interact with the EHR system through Natural Language Processing (NLP) and AI, which comprehend and fulfill verbal requests from clinicians and other employees in the premise. EHRs can be made meaningful through the use of interactive technologies that allow for interaction with a patient’s EHR through voice recognition and NLP, along with an intelligent user interface, featuring chatbots. Interoperability methods that allow multiple healthcare facilities to upload their EHR data onto a common platform. Context relevance, through the use of AI, can be embedded into voice and text messaging technology to provide relevant and meaningful results and answers. Specialty-specific modules can be built that offer relevant data to clinicians and thereby reduce the time spent in front of a computer. As a subset of AI, ML is now empowered with the ability to significantly improve performance of EHR systems and make decisions without human involvement. This is done through experiential learning and intelligent analysis being replaced by programming rules. Pattern identification is another feature that works through neural networks in a manner similar to the human brain, but more accurate and efficient. Functionalities, such as, voice recognition, facial recognition, predictive and preventive analysis and spam detection can be incorporated into data systems for further accuracy. Through AI algorithms, mobile applications can now offer seamless interactions and experiences. AI on mobile applications will allow devises to collect, sort and store data in a relevant and meaningful manner through the analysis of observed and collected behavior via sifting. ‘Smart Apps’ that are embedded with AI can engage patients in their own healthcare by making data upload effortless and adding customized options. EHR systems can use ML technologies to create distinct sections for pop health, telemedicine, voice interactions and clinical support, while being on the same platform. The predictive analysis technology of AI can render itself toward offering preventive treatment plans based on detecting health patterns through smarter mobile apps. Interoperability and modern data exchange can be incorporated through clean data inputs via mobile apps that are empowered to structure data based on intelligent analysis. Through ML, modern data standards and cloud-based platforms, productivity can be considerably increased and reliance on the keyboard reduced. 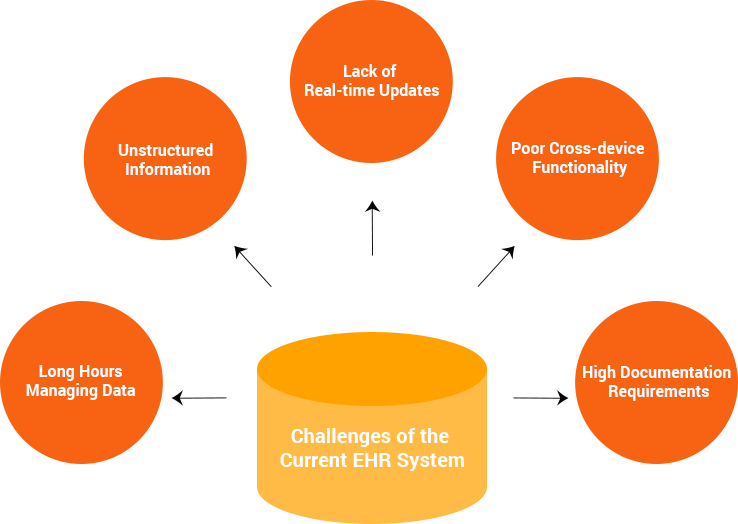 The current EHR systems are unstructured, time-consuming due to their poor designs, incompatibility with mobile devices and impractical functionality. Through constant improvisations in technology and mobile devices, the manner in which patients can interact with doctors and physicians is poised to be transformed. AI and ML are witnessed to be making disruptive breakthroughs in this domain. Engaging patients is now a reality that every healthcare organization can hope to achieve. To gain a competitive edge, healthcare agencies must now look to adopt AI and ML technologies that can augment their EHR systems into achieving what was originally perceived as the goal. It can go a long way in engaging patients, customizing communication between patients and doctors, optimizing administrative tasks through mobile app development.